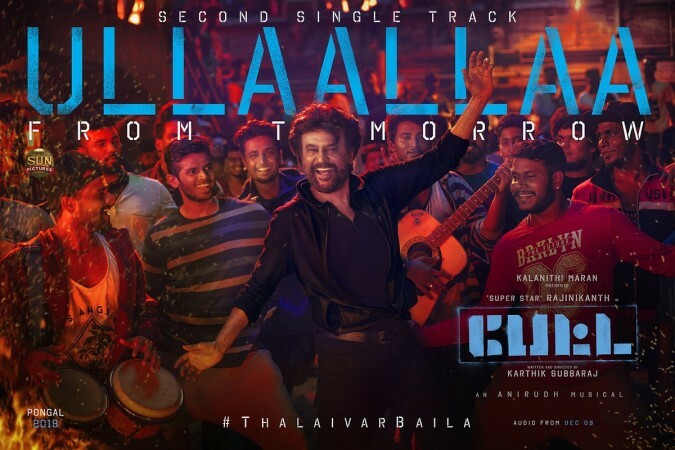 The second song, Ullaallaa from Rajinikanth's Petta, has been released on Friday evening. It is sung by Nakash Aziz and Inno Genga. Days after treating fans with 'Marana Mass' track from Petta, makers of the film have given one more reason to celebrate as the second second single from the flick is unveiled. A number titled Ullaallaa has been released on the YouTube page of Sun TV at 6 pm on Friday, 7 December. Nakash Aziz and Inno Genga have sung the song for which Anirudh Ravichander has composed music. Vivek has written the lyrics for this song. As per the music director, it is a jolly number for which he has taken inspiration from the stadium scene in Rajini's blockbuster movie Thillu Mullu. It is a foot-tapping number which has instantly won the listener's appreciation. The voices sync well with the guitar and trumpet. The makers have tried to build a lot of hype around Petta's album by releasing singles. The recent song Marana Mass, which was sung by SP Balasubrahmanyam and Anirudh has struck a chord with fans. It is slated to be the intro song for Super Star in the Karthik Subbaraj-directorial. Anirudh, who is a relative of Rajinikanth, is scoring for a Super Star movie for the first time. Hence, it is believed that he has taken a special interest in composing his tunes. The complete album will be launched in a grand event on Sunday, 9 December at an engineering college in Chennai. The event will be graced by the cast and crew of the Sun Pictures-produced movie. Petta is a mass-masala entertainer in which Vijay Sethupathi and Bollywood actor Nawazuddin Siddiqui are playing roles with negative shades. Whereas Trisha Krishnan and Simran play the female leads. Petta will hit screens on Pongal 2019.